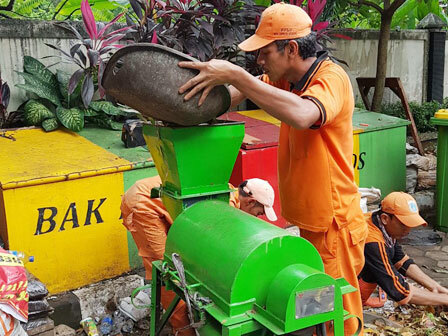 Cipete Utara Urban Village PPSU personnel in Kebayoran baru, South Jakarta, transforms organic waste into compost.
" From morning road sweeping, fallen leaves are collected and processed to be compost"
Waste is processed at local urban village office's waste bank. Cipete Utara Urban Village Head, Mohammad Yoan said, PPSU personnel is active to run waste bank in his urban village. Organic waste is collected from leaves that fall on the road and processed into compost. "From morning road sweeping, fallen leaves are collected and processed to be compost," he explained, Monday (3/26). He mentioned, last year, composting training has been given by South Jakarta Environment (LH) Sub-dept. to PPSU personnel. Then it is applied to manage collected organic waste. "Organic waste weighing and processing are done every week," he added. His side attempts to process all waste in the waste bank. Based on weighing, average inorganic waste reaches 530 kilograms with value of Rp 1 million. "Inorganic waste is sold to Transit Waste Bank owned by South Jakarta LH Sub-dept. while organic waste will be processed into fertilizer and it will be used for plants in the area," he conveyed. For information, currently Cipete Utara Urban Village has 20 waste banks. Those waste banks are targeted to reduce waste up to 2 tons per day.